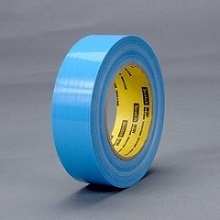 3M Scotch® Filament Tape 8916v is a blue, polypropylene backing reinforced with glass yarn filaments. It has a synthetic rubber resin adhesive. Has a non-staining, clean removable adhesive. Synthetic rubber adhesive attaches on to a wide variety of application surfaces. Reinforced for heavy duty applications.